Herd behavior in the domestic situation is a realm which most of us are only beginning to explore. 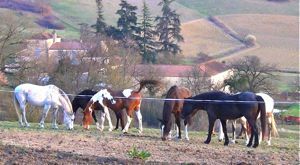 Most horse owners do now understand that horses need the company of their own kind, but allowing domestic horses to form similar family structures to wild horses despite the obvious differences, can become a wonderful project. It is great for them as well as being convenient and liberating for us. Most importantly, keeping horses in this way we can bring back the wonderful wild horse energy that is sadly so often missing in our domestic horses. As our herd has grown and we have realized that keeping them separated into small groups is not necessary or even good for them, we have been fortunate enough to see different relationships bud and blossom and to follow the general behavior of the herd as it strengthens and evolves. We now take it for granted that horses have sophisticated emotional connections with each different member of their family, just as we do, and that these relationships can change and evolve over time. See Horse Personality Dynamics In The Herd for a discussion about how horse's relations in the herd influence how they behave with humans. Introducing new horses to an established herd can be a worrying experience for owners, especially when kicking horses are common, and injuries can be inflicted all too easily. Over the years we have had many different experiences of integrating horses and have worked out a good plan which avoids as much of the risk as is possible in such a delicate situation. 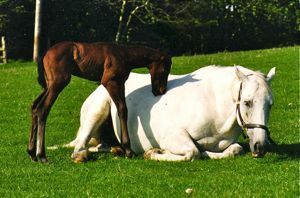 Like many horse owners, we were advised to separate our pregnant mares from the rest of the herd for many different reasons. In fact this was not doing them a favour in any way, and as the herd dynamics of wild horses shows us, the herd structure is highly valuable for both mare and foal. 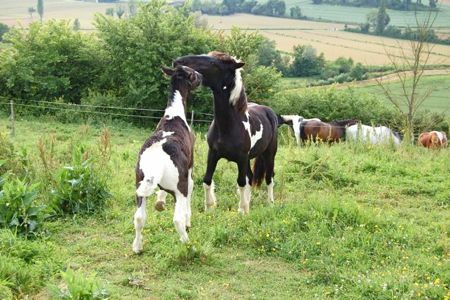 The herd environment is an essential part of healing and rehabilitating traumatised horses, providing the social stimulation required by any normal horse.